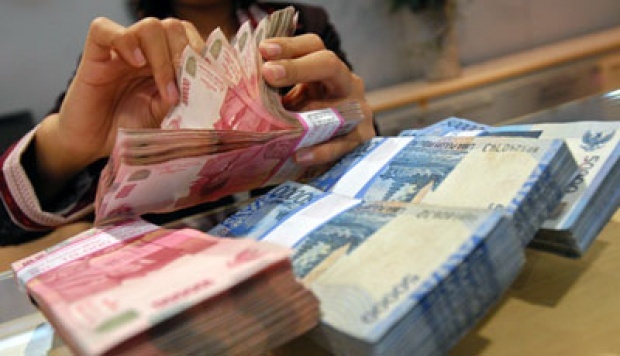 About five months ago, the rupiah touched a 17-year low amid major concerns about China's hard landing (and yuan depreciation), the looming US interest rate hike, and the continuation of Indonesia's economic slowdown. However, in October 2015 the rupiah suddenly rebounded sharply as US economic data was bleak (suggesting the timing was not yet right for a US interest rate hike), while market participants were also content to see the efforts of Indonesia's central bank (Bank Indonesia) to intervene heavily in markets in order to support the rupiah (this showed that Indonesian authorities would not let the currency sink any further; also supported by a series of government economic stimulus packages released since September 2015). After this rebound the rupiah started to depreciate again until the year-end due to concerns about the global economy. However, after seeing Indonesia's better-than-expected Q4-2015 GDP growth figure (released on 5 February 2015) investors seem to have regained confidence in the country's economic fundamentals and specifically in the government's capability to boost economic growth. As a result, foreign investors have increased investment in Indonesian (corporate and state) bonds, stocks, as well as foreign direct investment (FDI). These capital inflows are partly responsible for the strong performance of the Indonesian rupiah over the past weeks. Foreign investors recorded a net buy of around 260 million on the Indonesia Stock Exchange (IDX), while foreign ownership of Indonesian state bonds rose from 38.21 percent (of total bonds) in late 2015 to 39.01 percent currently. So far this year, the Indonesian rupiah has appreciated 4.6 percent against the US dollar, hence being the best-performing Asian currency. Momentum of the Indonesian rupiah could grow further if commodity prices can rebound (Indonesia being a key commodity exporter). Global oil prices have been rising over the past couple of days, now hovering around the USD $35 per barrel level, while analysts start talking about oil prices rising towards the USD $40-50 per barrel level later this year. This would also encourage the upward movement of prices of other commodities such as crude palm oil and coal. Although Indonesia's inflation rate accelerated more than expected in February 2016 (to 4.42 percent y/y), concerns have eased after state-owned energy company Pertamina announced it plans to lower the gasoline price (Premium) in April 2016. The lower fuel price should encourage lower inflation (each quarter Pertamina adjusts the fuel price based on the movement of global oil prices). With negative interest rates in the Eurozone and Japan, while there remain major concerns about China's economic performance and - to a lesser degree - about the US economy, Indonesia is one of the high-yielding markets that manages to attract investors' attention. The benchmark interest rate of Bank Indonesia now stands at 7.00 percent, still relatively high (but lower compared to Brazil and Turkey).